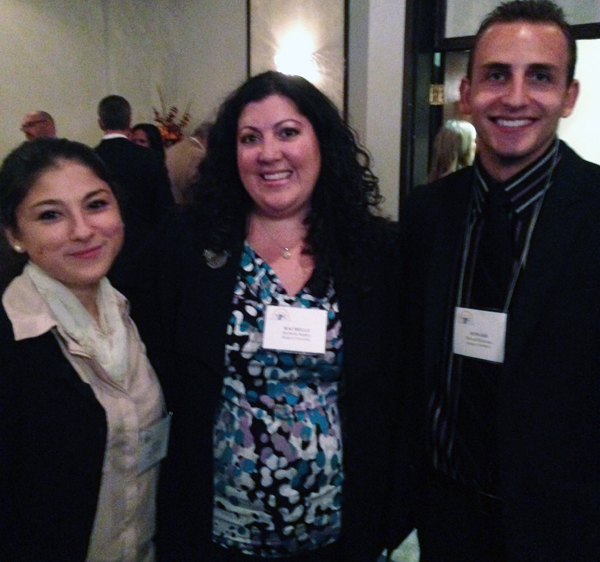 Three Political Science Honors students in a seminar on Business and Government, Rachelle Rankin, Howard Robertson and Tamari Ramishvili were able to attend the New Jersey State Chamber of Commerce Legislative and Business Awards Dinner on October 9, 2013. They heard commentary on business and government cooperation from awardees State Senators Fred Madden (D) and Anthony Bucco (R), Assemblymen John Burzichelli (D) and David Rible (R), and Department of Environmental Protection Commissioner and former VP of Accenture Robert Martin. In addition, they were able to discuss current policy matters such as the impact of the Affordable Care Act and the Dodd-Frank bank reform with business leaders from southern New Jersey. ‹ Previous: Dr. Fortner discusses Martin Luther King Jr. This page was printed from http://polisci.camden.rutgers.edu/2013/11/04/three-political-science-honors-students/ at 4:27 PM Sunday, April 21, 2019.